In March of 1992, Situ Rinpoche produced a prediction letter allegedly written by the 16th Karmapa. The letter gives the names of parents and a place of birth. A few weeks later, Situ Rinpoche’s people found a young boy in Tibet, meeting those criteria. Shamar Rinpoche, who had announced “Thaye Dorje” as the name of the 17th Karmapa only the previous year, would not accept the letter as authentic – unless it could pass a proper examination using scientific means. Nevertheless, China appointed Situ Rinpoche’s candidate as the 17th Karmapa Ogyen Trinley. Subsequently, the present Dalai Lama confirmed him, and his enthronement took place in September, 1992. The entire process was carried out without the consent or participation of The Karmapa Charitable Trust (hereafter referred to as the “KCT”), Karmapa’s own administration. As to the prediction letter, a copy was made and analyzed. The handwriting, signature, and letterhead were found to be at odds with those belonging to the 16th Karmapa. As to its content, the many mistakes in the writing convinced Tibetan teachers and scholars that it could not have been written by the 16th Karmapa. What are those mistakes? Topga Rinpoche wrote a commentary noting each one. After Situ and Gyaltsap Rinpoche’s candidate was enthroned as the 17th Karmapa, the Vajra Crown of Karmapa, kept in Rumtek Monastery, became their next target. And the 16th Karmapa had entrusted Rumtek to the care of KCT. The KCT challenged their occupation of Karmapa’s seat monastery in court. In 2004, the courts in India ruled that only the Karmapa Charitable Trust – not Situ or Gyaltsap Rinpoche – has the legal authority to manage Karmapa’s estate. The Court of India will soon deliver its final settlement regarding Rumtek Monastery. Today, the Karma Kagyu School is split under two spiritual heads. Neither one could set foot in Rumtek, Karmapa’s home and monastery. As well, whether Karmapa’s centuries-old dharma lineage could retain its religious autonomy and integrity remains to be seen. These adversities might very well be the threats which were forewarned by both the 5th and 16th Karmapa. Situ Rinpoche went behind the backs of Shamar and Jamgon Rinpoches, using the Tsurphu administration to organize a search in Tibet. He had reneged on his word and did not keep the prediction letter a secret. His people in Tibet supposedly found Karmapa Ogyen Trinley on their own. In a taped interview from June 9-11, 1992, Drubpon Dechen, the abbot of Tsurphu divulged the details, showing that Situ had started his own search despite his agreement with the other three rinpoches.2 Drupon Dechen stated that on April 8, 1992, Lama Tomo of Tsurphu Monastery headed a search party of five people, and left Tsurphu. They found the boy by April 24th, 1992. His picture was taken on that day as proof. It is suspicious that Lama Tomo and his team took only 16 days to find the child. In China, such activities must be approved by the government. The application alone would have taken longer than 16 days. The search party could not have found the boy so quickly unless the search had been previously arranged. As it happened, the Chinese government was involved, and later officially appointed Ogyen Trinley as the Karmapa Lama. This was confirmed by the first secretary of the Chinese ambassador in New Delhi. During their meeting in 1994, the Chinese secretary stationed in New Delhi told Shamarpa that the Chinese government would never be influenced by a prediction letter from anyone, nor would they need or use a letter to find Karmapa. They would use their own methods to select a candidate and prep him for the role. The Chinese secretary, Mr. Wong4 also told Shamarpa that Situ Rinpoche had offered his assistance to China as early as 1985. At that time, he had promised that he would accept a Karmapa of China’s choice. As a result, Situ Rinpoche was appointed to the Chinese government’s committee to look for a suitable candidate to be the Karmapa reincarnate. Ogyen Trinley was selected by this committee after the government was reassured that the boy’s family would not pose any threats or challenge to their authority. Was Situ Rinpoche’s prediction letter a fabrication after the fact to make the selection appear more credible? And so for the first time since the democratic reforms of 1959, the Central Government in Beijing approved the recognition of a reincarnated living Buddha. On September 27th, 1992, Karmapa Ogyen Trinley was officially enthroned at Tsurphu Monastery with the full sanction of the Chinese government – “uninfluenced” by any prediction letter. I would also like to preface Topga Rinpoche’s analysis with some explanations to give a proper perspective on his writing. Situ Rinpoche’s prediction letter consists of just three short verses; yet the multitude of spelling and grammatical errors found therein have made it the target of mockery throughout Tibetan academia. These mistakes reveal the writer’s lack of basic proficiency in the Tibetan language. 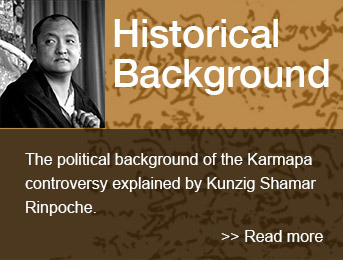 The 16th Gyalwa Karmapa could not have been the author of such poor scholarship. Topga Rinpoche, the late general secretary of Karmapa’s administration, was a respected scholar of Tibetan history. In 1994, he published a book in Tibetan on the Karmapa controversy, called Assorted Tales on the Art of Thinking. In this book, Topga Rinpoche offers his perspective on the controversy over the 17th Karmapa. He presents a humorous analysis of the prediction letter, directly addressing Situ Rinpoche as its writer. In this text, Topga Rinpoche clearly assumes the prediction letter is a fake written by Situ Rinpoche. The style of Tibetan critiques – such as Topga Rinpoche’s – follows the ancient Indian tradition of examination, which involves rigorous debate to ascertain the validity of the thoughts, arguments, and theories in question. A skilled debater often employs humour and sarcasm as tools of persuasion, to elicit emotional responses from the audience. The point is to engage participants to think in a critical way. Arguments can be bluntly hurled at the opponent to expose faulty logic. If you have seen Tibetan debaters at work, you have likely noticed them clapping away with their hands as they punctuate their arguments point by point. In his analysis, Topga Rinpoche pointedly shows how Situ Rinpoche tried to make the words in the letter fit the names of the parents of Karmapa Ogyen Trinley, as well as his birth year and the place where he and his family lived. Topga Rinpoche takes great pains to examine every grammatical error in Situ Rinpoche’s prediction letter because it forms the concrete evidence that the letter is a fake. He also addresses Situ Rinpoche directly, which is again a stylistic tactic to strengthen his arguments. A photocopy of the original letter produced by Situ Rinpoche is presented here showing all the Tibetan words along with its first English translation by Situ Rinpoche’s disciple, Michele Martin.7 To follow along with the analysis, I have inserted translations that reflect the original grammar of the writing. This grammar is the subject of Topga Rinpoche’s analysis. Again, the English sound of the Tibetan words in the prediction letter are provided syllable-by-syllable, followed by a word-for-word translation in English. I have also included Michele Martin’s original English translations for comparison. They are marked “M. Martin.” Ironically, Martin’s English translations convey more closely what the writer intended the letter to say, thereby making clear the writer’s inaccuracies and mistakes. Here follows the edited translation of an excerpt from Topga Rinpoche’s Assorted Tales on the Art of Thinking, which is his analysis of the prediction letter produced by Situ Rinpoche. All footnotes are mine. A dakhey zhalchem is a letter written prior to one’s death, in which the writer gives information regarding his next life; for instance, where and when he will be reborn, and other details. Not surprisingly, only great bodhisattvas are capable of writing such letters. Ordinary people simply do not possess this degree of foresight. Writing a dakhey zhalchem that predicts the future is a distinctive characteristic of the Karmapas. A dakhey zhalchem can also reveal other information. It might contain predictions or commentaries on future events; for example, the 13th Dalai Lama, a great hero of Tibet, once made a prediction about the future of the country. In 1992, Situ Rinpoche announced that he had suddenly discovered a dakhey zhalchem in an amulet pouch worn around his neck. Moreover, he claimed that the author of the prediction letter was none other than the 16th Gyalwa Karmapa. At first glance, the letter appears simple; a few lines written in verse. Anyone who is adequately educated in Tibetan however, will find many contradictions and inaccuracies. This is a Sanskrit expression of joy – as when one experiences something extraordinary, inexpressible in regular words. It is hardly a fitting introduction to a dakhey zhalchem; a great bodhisattva is usually sad and compassionate as he writes about his future rebirth. He is sad out of concern for the negativity in the world, and as he laments the bad karmas of beings, he feels compassion for their suffering. A bodhisattva knows it is the appropriate time to die when he is no longer useful to others; and he will choose to be reborn in order to continue his activities to help other beings. Sadness is a common characteristic of letters like this; but suddenly, in Situ Rinpoche’s letter, we find a Karmapa filled with wondrous joy. “E Ma Ho!” he cries, as if amused by his coming death. It is odd that a Karmapa should take delight at the prospect of his followers’ mourning. Perhaps it is Situ Rinpoche who is expressing his own amusement here, marveling at his clever deception in misleading Karmapa’s followers. Here we find the Tibetan word, “rig” (awareness) misspelled as “rigs” (caste).8 This is a typical mistake for Situ Rinpoche, which can be found throughout his writings. On the other hand, if he did mean caste, then to which caste was he referring? And what exactly would be the “comfort” of that caste? Perhaps he did not mean to say “comfortable.” He may have wanted to say “blissful,” which is a state of samadhi. 9 However, if Karmapa was in samadhi, then he would not be able to find his “self” either. If there was nobody there to begin with, then who would be feeling always comfortable? Or was he expressing his own comfort in thinking that no one else had a letter, so he could write whatever he wished? He reminds me of a draegar,10 who looks like a clown with a painted face, his nose studded with gem stones and holds a staff. As Topga Rinpoche has pointed out in his commentary, Martin’s translation does not convey what the Tibetan words actually say. Here is an explanation on a draegar. A draegar was a singing vagabond in olden day Tibet, who usually wore colorful costumes that involved a turban, ornate earrings, and colorful stones in his facial piercings. One by one, he would point to every accessory and sing his own praises, bragging about how special each piece was, befitting only kings and gods. To (or in) place of dharma, or dharmadhatu, center edge is not there. You (Situ Rinpoche)12 write that self-caste is always comfortable in Dharmadhatu, where there is no centre or edge. Yet, can there really be comfort in dharmadhatu? Comfort is a worldly state and as such, it has a centre and edge. It does not belong in dharmadhatu. -Topga Rinpoche’s remarks here are based on his read of the word “dhe” as comfortable. Comfort is considered a dualistic state, which has limits. Anything that has limits has edges and a centre. To say that a dualistic state of comfort can be found in dharmadhatu is thus a fallacy that is untenable in Buddhist thought. On the other hand, I could apply Situ Rinpoche’s own logic to himself. His logic is that things of this world, like comfort, can be limitless and endless. Therefore, Situ Rinpoche’s entire scheme of deception – which is also of this world – will see no end. In other words, his fabrications will be endless. A draegar would go on singing his own praises endlessly, much like Situ Rinpoche’s dharmadhatu of fabrications can go on forever. Therefore, I must compliment you on your fine accomplishments as the draegar’s understudy par excellence. When a series of fabrications and a comfortable mind are joined together, the lies are bound to be exposed. One such tale is Situ Rinpoche’s claim that the 16th Karmapa gave him a neck pouch with a prediction letter in it. This supposedly happened when they were together in Calcutta, India. Note that the preposition found in the original words, which connects this phrase to the previous one, has been omitted in Martin’s translation. As a result, this phrase in Martin’s translation becomes a stand-alone statement without much relevancy. The snow land of Tibet (“kha wa chen” is the name of Tibet) is indeed located north of India – this happens to be the only correct piece of information in the entire letter. The region of self-happening “burning metal sky” of god. “Burning metal sky” is a metaphor for thunder. Therefore, you are pointing to a region of the thunder of god; but why? Ask a Tibetan, and he will tell you that Lhathok means “place of god” or “roof of heaven.” Lhathok certainly does not mean “thunder of god.” Something is amiss here. Situ Rinpoche’s misunderstanding is clearly shared by his disciple, M. Martin, whose translation shows divine thunder. While their misunderstanding of Lhatok is certainly understandable, it is unimaginable that the late 16th Karmapa could have made this same mistake on paper. It is thus difficult for a Tibetan, or someone who knows Tibetan well, to believe that the author of Situ’s prediction letter was the 16th Karmapa. Beautifully adorned of nomad camp “wish-fulfilling cow”. It is reasonable to surmise here that Situ Rinpoche wished to convey a place where there are cows, since that description would fit the land where Ogyen Trinley and his family were found. Perhaps Situ Rinpoche thought he was being clever when he chose to write “doe jo” instead of referring to ordinary cows. Or perhaps he simply does not know that the Buddhist “doe jo” is an extraordinary cow, and that there’s only one in the universe. Unfortunately, ordinary cows do not grant wishes, even if you called them “doe jo”. -The second phrase about the mother’s name is grammatically incorrect; just as in English, “to opinion” is not a verb. The correct verb would be “to opine,” as in “to offer her opinion.” However, the Tibetan words do not reflect the correct grammar. According to “the local coconut telegraph” (a phrase similar to the expression “I heard it through the grapevine”), Situ Rinpoche had already met Ogyen Trinley some years before 1992. The boy was actually recognized as Kaleb Lama of a small temple in Lhathok in 1991. Situ Rinpoche was involved in this recognition. However, he seemed not only to have changed his mind, claiming that the boy was now Karmapa’s reincarnation, but also supposedly had completely forgotten that he already knew the boy. When Ogyen Trinley was a baby, his father requested the Khamapagar Monastery to accept him as a monk. He thought his son was the rebirth of his deceased relative, Kaleb Lama, who was in charge of a small temple called Kaleb Temple. The administration of Khampagar Monastery agreed to admit the child as a monk, and gave him the name of Kaleb Lama. In 1991, during Situ Rinpoche’s stay at his own seat, Palpung Monastery, he invited the boy and his family there. He told the parents that the boy would be recognized as the 16th Karmapa’s reincarnation. Situ Rinpoche gave the boy a beautiful red coral mala, or prayer beads. During a public prayer ceremony, Situ Rinpoche arranged for the boy to be seated in the very front row of the many attending monks. The boy’s presence was thus conspicuous and rumors quickly spread within that community. It was Adro Rinpoche who recounted the whole affair to the Rumtek administration. The venerable Adro Rinpoche is now a 70-year-old Karma Kagyu teacher who was visiting Palpung at the time. He and the entire monastery staff of Khampagar Monastery are witnesses to those events. They all know that the boy was first named Kaleb Lama and was for a short while one of the Khampagar monks. Situ Rinpoche, you already knew that the parents’ names were Thondrub and Loga at the time you wrote the letter. You used the adjective “thab” for Thondrub and “Sherab” for Loga, which would have been fine. But somehow, you wrote Lolaga, instead of Loga, and made another grammatical mistake. When one uses “la” before “ga” in Tibetan, “ga” becomes a verb meaning “to like” or “to prefer.” The meaning thus becomes, “liking or preferring to opinion.” This is not the name of the mother at all; her name is Loga, which is actually just a nickname. This bad grammar turns a simple name Loga into “likes to opinion,” a phrase which makes no sense. Such language could not have come from a source of wisdom. Martin’s translation shows the mother’s name, Loga, written and translated as Lolaga. Some teachers think that Situ Rinpoche added “la” between “lo” and “ga”, to make the line rhyme properly; but in doing so, he inadvertently changed the meaning of Loga, but the flow of the line is still clumsy. (Born in) the year of the astrological sign of one using the land. The Tibetan calendar consists of sixty-year cycles. Each Tibetan year is based on twelve lunar months and lasts 360 days. Every year of the cycle is named by pairing the name of an animal with one of the five elements. The animals are 1. Rabbit; 2. Dragon; 3. Snake; 4. Horse; 5. Sheep; 6. Monkey; 7. Bird; 8. Dog; 9. Pig; 10. Mouse; 11. Ox; and 12. Tiger. Note that there is no human in any of these signs. The five elements are: 1. Fire; 2. Earth; 3. Iron; 4. Water; and 5. Wood. Each element is applied to two consecutive years before the next element in the cycle. For example, an Earth Mouse Year would be followed by an Earth Ox Year, followed by an Iron Tiger Year, and then an Iron Rabbit Year, etc. There are thus 60 combinations in total, and so the cycle repeats itself every 60 years. This line is supposed to point to the birth year of Ogyen Trinley, which happened to be the wood ox year. We can surmise that you were trying to convey that. However, “sa la chodpa” is commonly understood to mean king, or protector of the land. “Sa la chodpa” does not mean cow or ox. You, Situ Rinpoche, have mistaken it to mean ox, thinking that it is a poetic reference to an ox. The term can easily be found in a dictionary of Hindu or Tibetan poetry, but you did not bother to check. Martin does not translate the proper meaning of “sa la chodpa,” i.e. “king.” Grammatically, “chodpa” is an active verb meaning “using,” or “someone who uses,” a user. It is not the passive voice that Martin has made it out to be, as in “to be used by or for.” In any event, the Tibetan words written here simply do not convey or imply the meaning of “wood ox,” which would fit the birth year of Situ’s candidate, Ogyen Trinley. It was said that at Ogyen Trinley’s birth, his family heard the sound of a conch shell. When they looked, they did not see anyone, or any shell. King Gesar of Ling had a war bugle called “karmo gyangdrag”, which was a conch shell that he used to announce wars. However, outside of this special case, “karmo gyangdrag” does not generally mean conch shell at all. -Owing to faulty grammar, the Tibetan words in this particular line do not make sense. However, Topga Rinpoche learned that the family of Ogyen Trinley heard the sound of a conch shell during the birth of their son. He then surmised that it could be why Situ Rinpoche decided to use the war bugle of Gesar of Ling, found in the great oral epic of Tibet. The Gesar of Ling was an enlightened being who appeared as a Buddhist warrior king in order to defeat the enemies of the Buddha dharma. Perhaps Situ Rinpoche was trying to make the sound of an ordinary conch shell all the more impressive or miraculous. When I consider Situ Rinpoche’s aggressive, warlike activities, then the sound of the war bugle does fit nicely here. -Topga Rinpoche is referring to Situ Rinpoche’s acts of aggression on at least three occasions. The first attack was March 1992 on Rumtek Monastery, in which he enlisted the help of 89 young Khampa monks equipped with German knives hidden under their robes. The second attack on Rumtek was on August 2, 1993 with 1,000 people brought in from Gangtok and 200 soldiers sent by N.B. Bhandari, the chief minister of Sikkim at the time. The third attack was on the Karmapa International Buddhist Institute in New Delhi. At that time, three busloads of thugs desecrated the building and the shrine hall. If Ogyen Trinley’s family did indeed hear the war bugle of King Gesar of Ling, then by this very line, Situ Rinpoche has proven that even he can make accurate predictions. He, who cannot write Tibetan poetry following the proper rules of grammar, might very well be the reincarnation of the 8th Situ, who was unequivocally a great master of Tibetan poetry. Or did the family actually hear the voice of Karmo Gyangdrag, Acu Tompa’s wife? -Acu Tompa is a character in Tibetan folklore who tells jokes. His wife’s name is Karmo Gyangdrag, the same as the name of the war bugle of Gesar of Ling. So Topga Rinpoche is being humorous here by asking if it was perhaps the voice of the wife of Acu Tompa being heard by the family, and not some miraculous sound from a conch shell. We can see the word “miraculous” in Martin’s text, though it is not an accurate translation. Some people might think that hearing sounds without a source is “miraculous;” but Topga Rinpoche goes on to explain that this is actually a very bad sign. To hear the sound of a conch shell all by itself is truly a miracle; that is, if you consider hearing a sound without a source to be a good sign. In fact, hearing sounds that come from nowhere is a bad omen. The great Sakya Pandit once said, “Donkeys braying from the ground, animals uttering the human tongue, or unusual sounds coming from natural elements might all be wonderful for illiterates; but in reality, these are portents of disaster.”18 Strange sounds are not necessarily good omens. The same goes for unusual sights. Situ Rinpoche reported that when Ogyen Trinley was enthroned in Tibet, three suns appeared in the sky. If he truly saw them, then this too was a bad omen. According to Sakya Pandit, seeing round, sun-like objects in the sky, or a hole in space, etc., is an ominous sign. The uneducated might marvel at these as auspicious signs, but they are quite the contrary. Recently, Gyaltsap19 was selling small phurbas20 in Malaysia for thousands of dollars each. They were so expensive because those phurbas could dance. Just imagine daggers dancing on a table. Innocent Chinese devotees were willing to pay any price for these miraculous objects. In the end, the phurbas proved quite a lucrative venture for Gyaltsap. If those small phurbas truly danced, then, congratulations on making a good profit. But make no mistake: they were not auspicious items. Again, Sakya Pandit explained that if a practitioner’s religious implement decorated with a face of a deity were to cry, dance, or utter loud sounds, then one should consider it a bad omen. It meant that either the practitioner would fail in his religious practice, or that a disaster would come upon a monastery or upon a land of dharma. In fact, inauspicious signs appeared at Rumtek Monastery within the same month that Situ Rinpoche and his party came there and presented the so-called prediction letter. Something happened to the Buddha statue in the main shrine hall: water inexplicably seeped from the white mark between the eyes on the Buddha’s forehead. It eroded some gold paint and left a streak down the Buddha’s face. There is no scientific explanation for it. Something also happened to the Manjusri statue that graced the shrine hall of the Shedra of Rumtek.21 When the statue was first installed, the sculptor made sure that the sword was firmly attached so that it could not be removed by anyone. However, this sword fell to the floor with a tremendous thud one day. We could not understand how it happened. In hindsight, those signs at Rumtek foreshadowed an unspeakable transgression that would take place in the area – one which would deplete all the merits accumulated. As it happened, after Ogyen Trinley was born, Situ and Gyaltsap Rinpoches, two of the so-called regents, organized three violent attacks on Rumtek, a sacred ground, thus violating every fundamental principle of the Buddha dharma. Whether the signs that Situ reported were real or fake, the fact that they were connected to negative acts showed they were more likely evil omens than auspicious signs. Not one of them was as “wonderful” as he would have liked others to believe. (The one) called Karmapa is known everywhere. This means that your old friends, Thondrub and Loga from “ba kor” (land of cows), and your Karmapa with the year sign of either human or ox, will be famous. even need to read the so-called prediction letter found in his pouch to find them. The word “everywhere” is missing in this translation. The 16th Karmapa would not have written the words in the third person; this much we know of him. The words were meant to help us find him in his rebirth. For instance, the 15th Karmapa wrote in the first person in his prediction letter. This is how he referred to his future mother: “I see her womb as the place of my rebirth.” Note that he did not say, “This is the one who saw her womb as the place for one’s rebirth.” The 15th Karmapa also wrote clearly so that people would understand, as in: “I will be in such and such a place…” Obviously, as Situ Rinpoche was writing this letter, he forgot he was supposed to be Karmapa writing it. Otherwise, he would have written it as if he were Karmapa. (He) follows after the honorable Situ Rinpoche, Thonyod Drubpey. Alas, Situ Rinpoche, this is your ultimate goal! -Topga Rinpoche is being sarcastic here. The great Thonyod Drubpey is the current Situ Rinpoche himself. Topga Rinpoche is using common metaphors such as “the oxygen of air” or “the nectar of flowers” to metaphorically compare with “the prediction letter of the neck pouch” worn by Situ Rinpoche. Therefore, the essence of the neck pouch refers to Situ’s prediction letter. And what is the ultimate essence or meaning of that prediction letter? Situ Rinpoche wants us to know that the 17th Karmapa, born in the year of the ox, shall follow him. That is then the ultimate message or meaning of the said prediction letter. This is the only instance ever, of a prediction letter actually specifying the person whom the next reincarnate would follow. This is a major slip of yours, Situ Rinpoche, your ambition is so overflowing, your real intention so abundant, that it has fallen through your fingers. You should have known to hide it better. -I was told that Tibetans find the abovementioned line in particular to be hysterically funny. The current Situ Rinpoche’s formal name is Pema Thonyod Nyingje Wangpo. All Tibetans know these words were meant to point to him. In Tibetan culture, one would never be as bold as to name oneself as the person Karmapa should follow. “Jey” is an honorific address in Sanskrit, much like the English “Sir” or “Mister.” Tibetans would never use this to address a Buddha or a very high Bodhisattva. Therefore, “Jey Thonyod Drubpey” refers not to the Lord/Buddha Amoghasiddhi. Rather, it is an honorific way to address a human of that name. In this context, it can only be pointing to the current Situ Rinpoche — it is his name. Martin might have tried to fix the gaffe by interpreting the Thonyod Drubpey in the line as a reference to Lord Amoghasiddhi, the great Buddha/Bodhisattva. She bypasses the word “Jey” for a human, and uses “Lord” for a Buddha. This might go undetected by non-Tibetans who are unaware that “Jey” is never used to address a Buddha, but for Tibetans, it is clearly a mistake. Moreover, the sentence in Martin’s translation, “He is sustained by Lord Amoghasiddhi, being non-sectarian, he pervades all directions” is not in the original Tibetan text. There are other modified forms of this line presented by Situ Rinpoche’s supporters. Here is one example of those attempts: “A man who accomplishes things well will be the guide.” Note that this translation at least correctly points to “a man” as being the guide, but omits the name of Situ Rinpoche. The protector of sentient beings (who are) in equanimity. The expression “neither close nor far” in Buddhist philosophy refers to equanimity. In this line, the words are written in such a way that they mean “sentient beings living in equanimity.” If sentient beings are already living in equanimity, then they don’t need protection. So why did Situ Rinpoche write this? This is not an accurate translation because the writing in Tibetan conveys that the sentient beings are in “equanimity” – often expressed as “neither close nor far”. The victor dharma benefits others the sun always burns. Situ Rinpoche has started the line by saying that the victorious Buddha dharma benefits others. He meant well in trying to draw a parallel between the dharma and the sun: obviously, he is attempting to liken the dharma to the sun that is always brightly shining. However, the grammar is still slightly off, so the words read as if the sun is always burning up the dharma. Situ Rinpoche, the grammatical errors found in your so-called prediction letter are also found throughout your own writing. I’m poking fun at them, and under normal circumstances, they would really not be that important. However, the fact that you forged a letter in the name of the 16th Gyalwa Karmapa is very serious, and these spelling and grammar mistakes are the precise evidence that rules out the Gyalwa Karmapa as its writer. You may refuse to have the letter scientifically dated, but whether the paper is holy or not, the words inked on it tell all. They could not have come from the wisdom of Karmapa’s mind, which would be the only source of a bona fide prediction. 1 It was later discovered that these people had taken money from the Rokpa Association of Akong Tulku, one of Situ Rinpoche’s partners. 2 KP: 99-102 for a complete transcript of the taped speech. 3 Rumtek administration found out later through their own investigation that it was in 1991 that Situ Rinpoche had chosen Ogyen Trinley to become the Karmapa. 4 Spelling may be incorrect – there are alternate spellings of this Chinese name. 5 KP: 94 for a photocopy of the newspaper article. 6 from a South China Morning Post column on June 29, 1992. 7 Copies reproduced from KP: 34, “DOC T 20”. 8 The Editor’s translations are parenthesized. 9 Samadhi is usually a meditation state in which the concept of a self is absent. 11 Martin’s translation is provided in the photo. 12 In many instances of his analysis of Situ Rinpoche’s produced letter, Topga Rinpoche addresses Situ Rinpoche directly as “you.” This is but one example. For the duration of Topga’s analysis, the reader should interpret the second person as Situ Rinpoche. 14 The highest, the most brilliant, and the sharpest, capable of cutting through all ignorance. 15 Topga Rinpoche is clearly being sarcastic with this comment. 17 The next earth ox year is 2009. 18 Sakya Pandita (1182-1251) was one of Tibet’s most revered lamas. He is renowned for his extensive knowledge of Buddhist teachings and exceptional skills in debate. He was honored by Godan Khan, the Mongol Emperor of China, and became his guru. 19 Topga Rinpoche knew that GYaltsap Rinpoche was one of the three main collaborators in the scheme with the Chinese government, along with Situ and Thrangu Rinpoches. They went to Tibet and enthroned Ogyen Trinley there with China’s support. Gyaltsap was sitting next to the Chinese officials during the ceremony. He also accepted the prediction letter when it was first presented, without even looking at it. 20 Triangular shaped ritual daggers. 21The Sri Nalanda Institute of Rumtek.